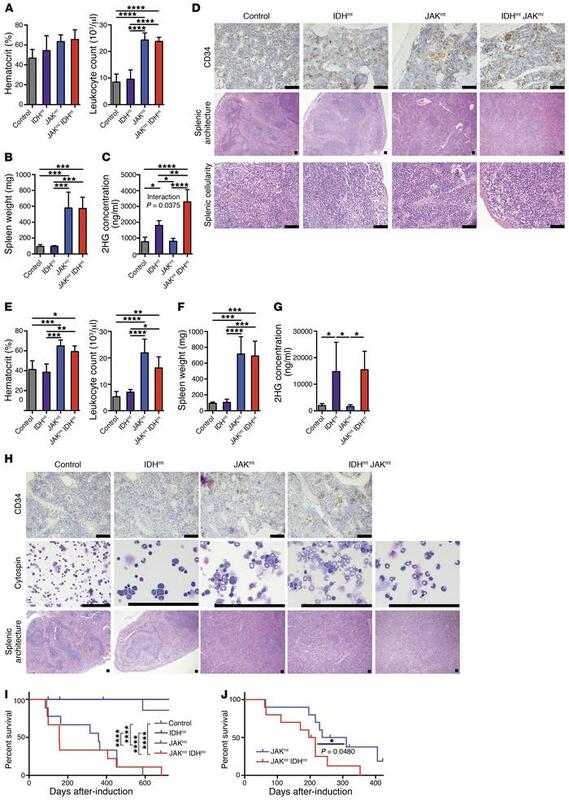 Combined Jak2/IDH-mutant mice have lethal MPN with preleukemic features. (A) Hematocrit levels and leukocyte counts in peripheral blood, (B) spleen weights, (C) 2HG levels in plasma, and (D) representative histology images for CD34 immunohistochemical stains of bone marrow and H&E stains of splenic tissue from primary IDH1R132H Jak2V617F Mx1-Cre mice sacrificed at approximately 6 months of age (n = 5/group). (E) Hematocrit levels and leukocyte counts in peripheral blood, (F) spleen weights, (G) 2HG levels in plasma, and (H) representative histology images for CD34 immunohistochemical stains of bone marrow, Wright-Giemsa stains of bone marrow cytospins, and H&E stains of splenic tissue from primary Idh2R140Q Jak2V617F Mx1-Cre mice sacrificed at approximately 6 months of age (n = 4–5/group). (I) Kaplan-Meier survival curve for primary IDH1R132H Jak2V617F Mx1-Cre mice following recombination. (J) Kaplan-Meier survival curve for secondary-transplant mice following injection of IDH1R132H Jak2V617F Mx1-Cre bone marrow. Scale bars: 200 μm. Multiple comparisons were performed using an ordinary 1-way ANOVA with Tukey’s correction for post-hoc comparisons and multiplicity-corrected P values. Comparisons of survival were performed using the log-rank (Mantel-Cox) test. Statistical interaction calculated for influence of Jak2 mutation status and IDH1 mutation status combined using 2-way ANOVA. *P < 0.05, **P < 0.01, ***P < 0.001, and ****P < 0.0001 by 2-way ANOVA. JAKmt, JAK-mutant; IDHmt, IDH-mutant; JAKmt/IDHmt, JAK/IDH-mutant.